The weekend is just around the corner. As usual, Indianapolis has several events that make removing your keester from its stagnant spot on the couch a worthwhile venture. In my opinion, the best bang for your buck can be found at Radio Radio tomorrow night. Louisville’s Whistle Peak is an act that I’ve been dying to see for a while now. I featured this project in a Band to Watch post back in early January. Their sophomore LP, Half Asleep Upon Echo Falls is one of the stronger regional releases of the year in my humble opinion. Listen to “Wings Won’t Behave” below. I can’t wait to check these guys out. Two of Indy’s strongest local acts will serve as appetizers. I have grown increasingly taken with former Slothpop frontwoman Kristin Newborn’s solo project KO. I’ve seen her a handful of times since her debut Record Store Day show at LUNA Music. Each time she has shown marked improvement in her control over the looping pedals that dominate KO’s performance. Her voice has been one of the strongest in the Indy music scene for the last couple of years, it was only a matter of time before the technology caught up. For anyone who has yet to see KO perform, make sure you arrive early enough to catch a glimpse. Listen to “i will run while it’s dark” and “plant me right back” below. Rounding out the line-up is Jascha. 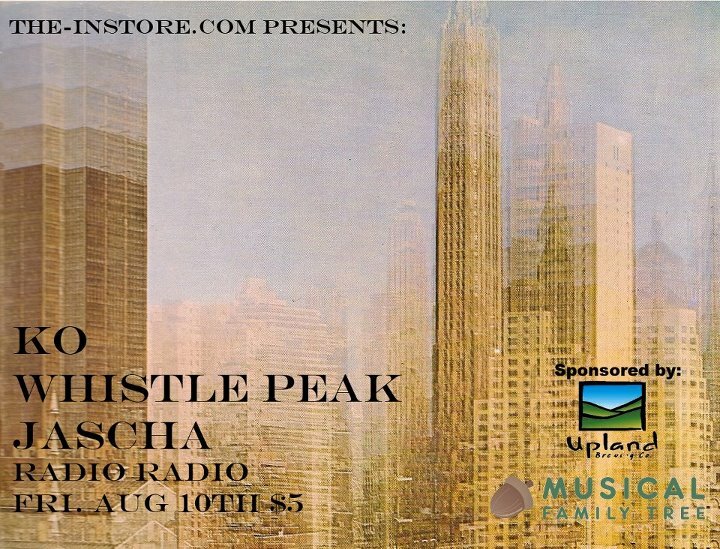 More established members of the underground Indy music scene, Jascha solidifies this lineup as one of the stronger top-to-bottom Fountain Square shows of the summer. Listen to “The Devil’s Own” below. According to Facebook, this will be one of Jascha’s last Indy performances, so don’t sleep on this opportunity! I hope to see every one out tomorrow night for what will no doubt be a memorable night of music. Cover is only $5. What do you have to lose?